New Winterized Bespoke Concrete Batching Plant for Skene Group. Rapid International Ltd have recently supplied a new, bespoke concrete batching plant to Skene Group at Soutra, Midlothian in the UK. This plant, housing a 3m3 pan concrete mixer, has been designed to operate in sub zero temperatures with all pipes heated and lagged and with the main water storage underground. Each of the aggregate bins on the plant are discharged using belt feeders, this prevents the malfunctioning of helmet doors in cold weather and enables the accurate measurement of moisture content using Hydronix probes. The main benefit of this feature is that it allows the concrete batching plant to dispense the accurate required water without any need for visual slump checks and therefore significantly increases the output of the plant. The concrete batching plant has the additional features of a moving hopper which allows the plant to be flexible for the production of other concrete products in the future. It also has a moving flume to facilitate the collection of concrete by smaller trucks and trailers. At the heart of the plant is the Rapid R3000 pan mixer, with an output of 3m3. Skene Group specified two discharge doors on this mixer and this allows the next truck to already be in position so that the plant can work efficiently and continuously. Since installation of the plant, there has been a significant increase in business from the Soutra Quarry for the Skene Group. The concrete batching plant itself is controlled using the PIL Dynamix System. This system is one of the most efficient and versatile systems on the market and allows the Skene Group Management to access and monitor all of the production data. It also provides total back-up from a laptop computer. The plant also has three 100 tonne silos installed which provide additional cementicious options. 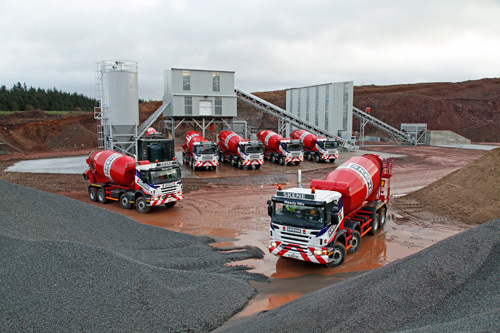 The Skene Group was established in 1968 and have a variety of high volume readymix concrete plants, capable of producing in excess of 1000m3 each day. The company is now recognised as one of the UK’s leading independent operators in the construction supply sector. 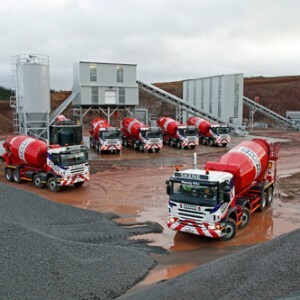 Rapid International are based in Tandragee, Northern Ireland and are one of the leading concrete machinery manufacturers in Europe. Accompanying their portfolio of concrete mixers, they also supply mobile batch and continuous mixing plants to companies across the globe.